Welcome to Rod's Overhead Door! 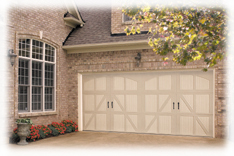 Providing residential new garage doors, openers & repair services for 22 years. Oil rollers, tracks and hinges on door with silicone spray. Staying 2" from each end of the spring, spray the springs and opener chain with white lithium spray grease. This will quiet your door down and help the door roll easier. The staff at Rod’s Overhead Door Inc. would like to welcome you to our Web site. We hope you will give us a chance to make the purchase of a new garage door or the repair of an existing garage door and garage door opener a better experience for you. We provide both residential and commercial installation of new garage doors and garage door openers. We do A-1 precision garage door repair, garage door spring repair, garage door opener service. We are dedicated to providing personalized service and professional workmanship to all of our customers, no matter how simple or complicated the assignment might be. We are family owned and operated, insured and offer free estimates on new garage doors and garage door openers. Give us a call today!